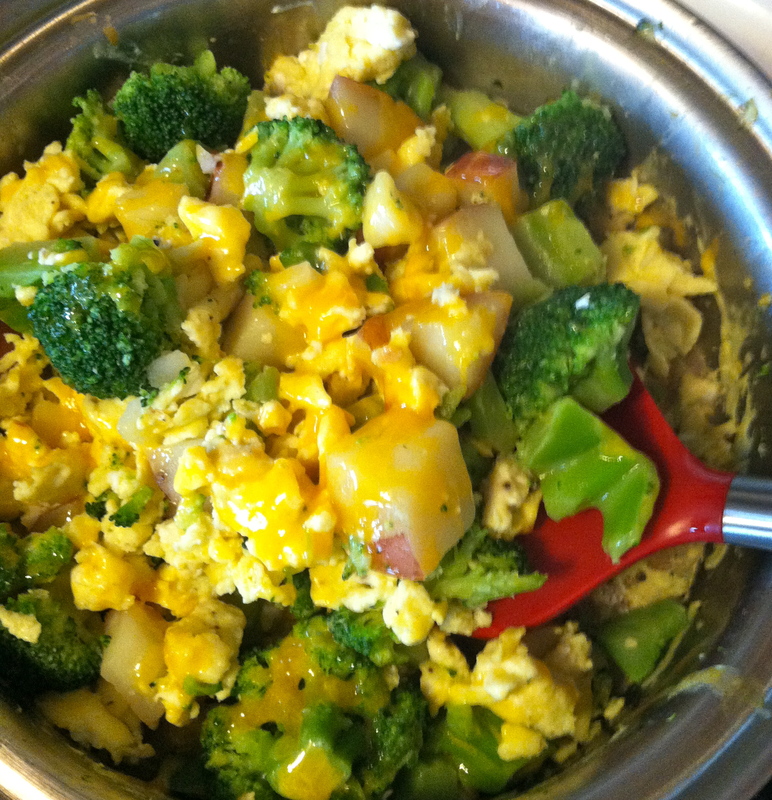 Easy Breakfast Scramble: Eggs, broccoli, red potatoes & cheese! Editor’s note: This is a guest post for the American Diabetes Association. It will be featured in the ADA Tour de Cure’s Twin Cities April Red Rider Reader. Hey Red Riders! Happy Spring to you! I hope this finds you both happy and healthy! I am excited to be bringing you another recipe for our April Red Rider Reader! We have had nice weather early this spring – I hope you are taking advantage of it and sneaking in some early training rides! I am excited to share this recipe I created with you. It’s ingredients are super yummy yet healthy too! It kind of reminds me of a loaded baked potato! It is also the perfect meal to eat before a training ride for the Tour de Cure or any other workout. In need of a quick, balanced meal — it can also easily be served for lunch or dinner as well. Heat up a medium saucepan with water. Add several large pinches of sea salt. Wash and scrub 4-5 red potatoes (locally grown red potatoes are really exceptional). Leave skin on for added nutritional benefit, taste and appearance (if desired, peel potatoes). I like to cut more to allow for easy leftovers to throw into another “breakfast scramble” meal the next day. Cut into medium bite-size cubes. Once water is boiling, add cubed potatoes to boiling water. Boil 10-12 minutes keeping water at moderate boil. Check at 10 minutes for desired level of tenderness – cook 1-2 minutes longer if you prefer. Remove water from pan and set aside potatoes. While potatoes are cooking, in a separate pan, add a splash of water (just enough to create thin layer of water across entire bottom of pan). Add 1/2 of 10 oz. bag of frozen broccoli to pan and cover with lid. Cook 5-7 minutes over medium heat until broccoli is hot and cooked through. Drain any excess water from pan and set aside cooked broccoli. (Note: you may prepare with fresh broccoli. (I prepared this recipe with frozen broccoli as a time-saving measure for times when a quicker meal is needed). Cut broccoli into flowerets and cook with covered lid with same amount of water until cooked to desired tenderness). Mix 2-3 eggs in small bowl. Add a pinch of Celtic sea salt and a few grinds of pepper from your pepper mill (or a few shakes). Whisk until frothy. Add a small amount of coconut oil to pan over low-medium heat. Melt and wait until pan is adequately hot. Add scrambled eggs to pan and stir eggs with spatula to heat evenly. Once eggs are cooked, add back in 1/2 cup cooked broccoli (or more – I always like a lot of vegetables) and 1/2 cup cooked red potatoes. Gently stir to distribute ingredients. Shred a few ounces of cheddar cheese evenly over the ingredients in the pan. Turn down heat to very low and cover pan. Wait several minutes, dish onto plate using spatula and eat! I hope you enjoy this breakfast scramble as much as I do and enjoy healthy blood sugars on your training ride too! Go Red Rider!!! 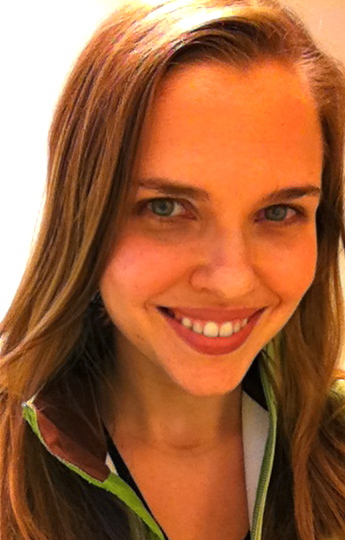 Cynthia just celebrated her 25th year of living with Type 1 diabetes in February, 2012. She loves yoga and long walks with her husband & dog Jonah. She participated in her first ADA Tour de Cure last year in 2011 and had an amazing experience as a Red Rider. She will be riding 27 miles again this year and is excited to be training and riding with a team of many individuals also living with diabetes - the Pancremaniacs. She is also passionate about behind the scenes stuff to make the Tour a success and currently serves on several committees. Please send her an email (diabeteslight@gmail.com) to learn about some of the ways you can help with the Tour de Cure & meet a lot of fun and passionate folks too. Cynthia loves meeting new people -- so please say "Hello" on June 2! Happy riding! What does D-I-A-B-E-T-E-S mean to you? I’ve accepted a writing position with DiabeticLifestyle! !